If you don't see Beaver Builder or Builder as a menu choice in the WordPress admin panel, it means that that it is disabled. Follow the instructions below to enable it. The Beaver Builder menu in the WordPress admin panel lets you create, edit, and delete custom layout templates and saved rows, columns, and modules just as you would any standard post or page. 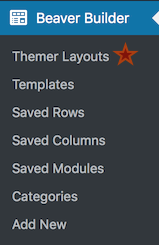 You can also add categories to organize your templates, rows, and modules. The Themer layouts option only appears when you have the Beaver Builder - Themer Add-On plugin installed. If Beaver Builder has been renamed under an Agency license at Settings > custom-name > Branding, the Beaver Builder menu appears as Builder. On the WordPress admin panel, click Settings > Beaver Builder, then click the User access tab. In the Admin section, go to the Builder admin field and select the user roles that you want to be able to see and access the Beaver Builder menu in the WordPress admin panel. Click Save user access settings.